Published in the South Kent Gazette, 6 August, 1980. The hillside rising from York Street up to the Western Heights has nothing of historical interest to recommend it, except the antiquity of "the everlasting hills.“ Even with regard to the hills, the term “everlasting" seems but a figure of speech, for, having been burrowed by railway tunnels and furrowed by fortifications, they bear conspicuous marks of mutability. These slopes of the Western Heights less than a century ago were ad tamed by fleecy flocks or waving corn. The road which is now called Military Hill did not exist, but at the top of Worthington Street, on a spot occupied by the Crown Inn, there stood a pair of blue gates forming the approach to the land above. That way was only for the convenience of the farmer who occupied the land, and his big barn stood in a field just above York Terrace. At the beginning of the 19th century the development of the Western Heights fortifications led to the formation of the North Military Road—better known today as Military Hill—from Worthington Street. The old road across the Heights from Haycliffe Road to Cow-gate had fallen into disuse when the road by Archclifle Fort and Limekiln Street was made a turnpike road, but there was another track which branched off towards the Priory, and that, when the North Military Road was opened, degenerated into footpaths, of which there are still left three, one between Clarendon Place and Selborne Terrace, one half-way along Clarendon Place, and one into Belgrave Road, all branching out of the old way over the Heights to the Priory. Although the military authorities made the new North Road, the owners of the adjoining land very soon took advantage of it to open up a new building area. From Priory Place up to Christ Church Schools the houses rapidly grew on each side of it without the permission or sanction of either the local authority or the War Department. In addition to the houses lining the main road, offshoots named Union Row, Blucher Street, and part of Mount Pleasant were built. These occupied the whole of the ground right up to land on the heights long held by the War Department. No sort of control was exercised over the builders, and it is surprising in those circumstances that the houses and streets were laid out as well as they were. The slope on the upper side of York Street and southward was deemed a suitable place for opening public houses and in a small area there were once the Marquis of Anglesea, the Crown, Royal Mortar, Marquis of Waterford, the Greyhound, Half Moon, Bowling Green Tavern, King Alfred and the Return. All were there soon after the streets around them were formed and certainly in greater numbers than were required by the inhabitants of the area. Evidently it was considered a strategic place being between the town and the soldiers’ barracks on the hill above, to which there was a steep climb. The streets, lanes, and rows laid out beneath the Western Heights were no sooner covered with houses than they were handed over to the Local Board of Health to be scavenged, drained and repaired, with the exception of the main thoroughfare, Military Hill, which was discarded by the town, and alternately owned and disowned by the War Department, passed forty years in the wilderness of precarious existence. When Union Row and Blucher Street were built with openings into Military Hill Road, the Commanding Royal Engineer promptly placed the local authority under a tribute of a shilling a year for each street opened to the hill; and the military, authorities once a year demonstrated their claim by putting up a barrier across the bottom, at York Street, to prevent civilians from using it for a period of 48 hours. At the close of 1859 there was correspondence between the town council and the Commanding Royal Engineer respecting a proposal that the road should be handed over to the local authority. The Corporation stipulated that the War Department should put the road in order, but the Royal Engineers contended that the surface had been broken up by the town’s drainage works. Nothing came of those negotiations, and on the 30th of November, 1869, the bottom of the road and its approaches from the side streets were barricaded, the barriers being kept up for 48 hours. 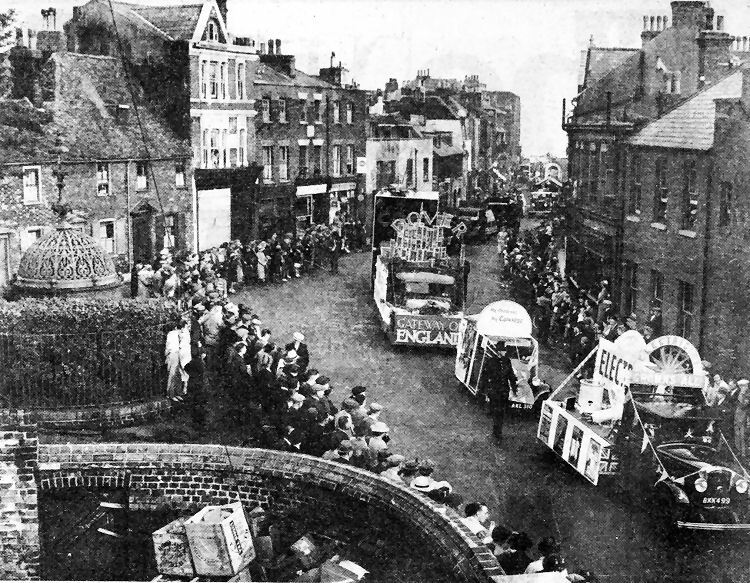 Carnival day in Dover just before the Second World War after which all the Woolcomber Street properties on the left had to be demolished due to damage by enemy action. Interesting feature on the left is the ornate wrought iron roof of the quaint public convenience which used to stand in the middle of the St James’s Street junction. Above is an engraving of the Promenade Pier from a design by Mr J. J. Webster showing the elegant pavilion it was proposed to build at the end of the structure, with a concert room seating 1,000 people, a dining room and reading room. In the event a somewhat less lavish building was erected. The 900ft.-long pier was opened with great ceremony on Whit-Monday 1893, before the pavilion was built. Performing the ceremony was Lady Dickeson whose husband, Sir Richard Dickeson, a prominent Dover businessman, was chairman of the pier company. The opening was made a fete day and townspeople and visitors thronged the seafront in numbers never surpassed before even on the most successful regatta days.